Akio Mimura was 11 when Sri Lanka’s former President J.R. Jayewardena stood up for Japan at the San Francisco international peace conference in 1951. World War II had been over for six years and the allied powers had been deliberating how vanquished Japan would be punished. They wanted the country on its knees, paying reparations. Mr.Jayewardena, a minister in Mr.D.S. Senanayake’s government, was the lone voice among the 51 nations gathered that day backing the vanquished. Quoting Buddha, “hatred cease not by hatred but by love”the statesman called for a free and independent Japan and that it should not pay a heavy price that would harm its economy. Today, Japan is highly-developed and is the world’s second-largest economy. The engine that drives the country is a vibrant private sector thriving on a free market economy. At the heart of it is the Japan Chamber of Commerce and Industry. Its chairman is Dr. Akio Mimura. Dr. Mimura, 77, is head of the powerful body which has a membership of 1.25 million companies. The total strength of the Japanese corporate world is close to four million companies. Set against these numbers, it is ridiculous that only 130 Japanese companies do business with Sri Lanka. The reason for this low number, according to Dr. Mimura is that “Japanese people still do not know the real picture in Sri Lanka”. An almost absurd reasoning if we consider the close and historical ties that bind the two countries going back to MrJayewardena and even before that. “There is no awareness of Sri Lanka in Japan. That is why we have come on this economic mission to find out what is really happening in Sri Lanka. The information I have gathered during my short visit, I will take back with me,” says Dr. Mimura who was in town last week leading a powerful delegation of Japanese businessmen seeking opportunities in this new El Dorado of the Indian Ocean. Dr. Mimura blamed the Japanese media for this lack of awareness in a country that is central to China’s new silk route, the One Belt One Road plan. Parochialism is nothing new to the media. Even in Sri Lanka, we are all caught up with what is happening in our own backyard and only look outside when a tragedy occurs. Bad news sells newspapers, good is taken for granted. During the war, Sri Lanka was on the radar but since its end in 2009, we have slipped out of the international consciousness, well apart from China, of course. Japan, both the government and the private sector, has realised its folly, and are now playing “catch-up to China who are ahead of us” as expressed by a member of the Japanese media accompanying Dr. Mimura on his ground-breaking visit to the island. Dr. Mimura can be your old uncle from next door. He is friendly and takes time explaining in detail the queries from the media at his end-of-stay press conference at the ShangriLa. Outside the room, the 77-strong Japanese delegation, a number of them chairmen and CEOs, are being treated to Dewar’s whisky and thin morsels of tuna. “Sri Lanka needs to create a business-friendly environment with a clear industrial policy. There must be a clear procedure in place. If investors are confronted with 100 problems, and if 80 of these are solved then I think that investment can go ahead smoothly,” Dr. Mimura pointed out. A schoolboy when J.R. was making his speech in San Francisco, Mimura graduated 12 years later from Tokyo University in 1963. He joined Fuji Iron and Steel and was with them when it became Nippon Steel Corporation in 1970 following a merger with another major steel company. 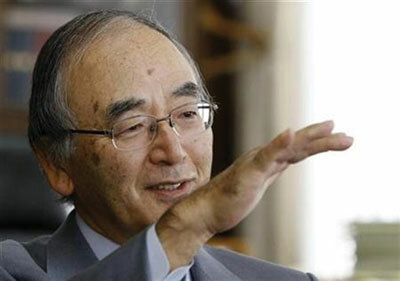 In 2003, he became president of Nippon Steel which at the time was the largest steel company in Japan. His career followed a traditional Japanese path: lifelong service to one corporation. His entire focus was on the company with golf being his only distraction, another typical trait of Japanese executives. Dr. Mimura didn’t have time to play golf in Colombo. His two-day trip was packed with a busy schedule including meetings with President Maithripala Sirisena and Prime Minister Ranil Wickremesinghe. While the Japanese corporate sector might be dragging its feet, the Japanese government has traditionally had close ties and helped Sri Lanka over the years. It has provided aid for a number of major hydro-electric power projects including Kotmale and Mahaweli, helped in the modernization of the Bandaranaike International Airport, railway and road development as well as the ongoing development and expansion of the Colombo Port. Last month Japanese Foreign Minister Taro Kono inked a deal to build Sri Lanka’s first liquefied natural gas terminal in collaboration with India. Going further back, Japan generously gifted the Sri Jaywardenapura General Hospital, Peradeniya Teaching Hospital and even gave us television by building the Rupavahini Corporation. Yet, on the private side, investment has been slow – only 130 Japanese companies are operating with local counterparts, the tip of the iceberg. He is hopeful that this inter-governmental relationship will also rub off on the Japanese private sector. “Sri Lanka is a country trying to do many things at the same time but there is great potential. The GDP per capita is almost 4,000 (US dollars) and is the highest in South Asia. The current situation is good,” Dr. Mimura summed up. Japan’s GDP per capita is almost US$40,000, a massive growth for a country which was once on its knees, and only arose thanks to the compassion of a Sri Lankan.